Historia's Torch Bearer helps people find things throughout Historia and Elysium Gates. They are the guide for a new member's orientation to this realm. They also encourage everyone to participate in our many activities. 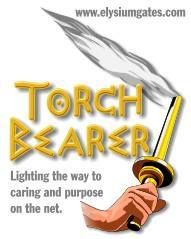 Torch Bearer's seem to know everybody, they are great networkers. If you shmooze with our Torch Bearers you too will soon know a great many people at Elysium Gates. Historia currently is in need of a Torch Bearer. Are you interested? You can apply for the position by following the links and filling out the form at Elysium Gates Foundation.